The simplest form of control for a spillway is the free, or uncontrolled, overflow crest, which automatically releases water whenever the reservoir water surface rises above crest level. The advantages of the uncontrolled crest are the elimination of the need for constant attendance and regulation of the control devices by an operator and the freedom from maintenance and repairs of the devices. A regulating gate or other form of movable crest control is required if a sufficiently long uncontrolled crest or a sufficiently large surcharge head cannot be obtained for the required spillway capacity. Such devices are also required if the spillway is to release storages below the normal reservoir water surface. Selection of the type and size of the crest control device may be influenced by such conditions as the discharge characteristics of the device, the climate, frequency and nature of floods, winter storage requirements, flood control storage and outflow provisions, the need for handling ice and debris, and special operating requirements. Whether an operator will be in attendance during flood periods and the availability of electric power, operating mechanisms, operating bridges, etc., are also factors that could influence the type of control device selected. Many types of crest control have been devised. The type selected for a specific installation should be based on a consideration of the factors noted above as well as economy, adaptability, reliability, and efficiency. Movable crests include such devices as flashboards, stoplogs, and drum gates. Regulating devices include vertical or inclined rectangular lift gates, wheel-mounted gates, roller-mounted gates, and radial gates. 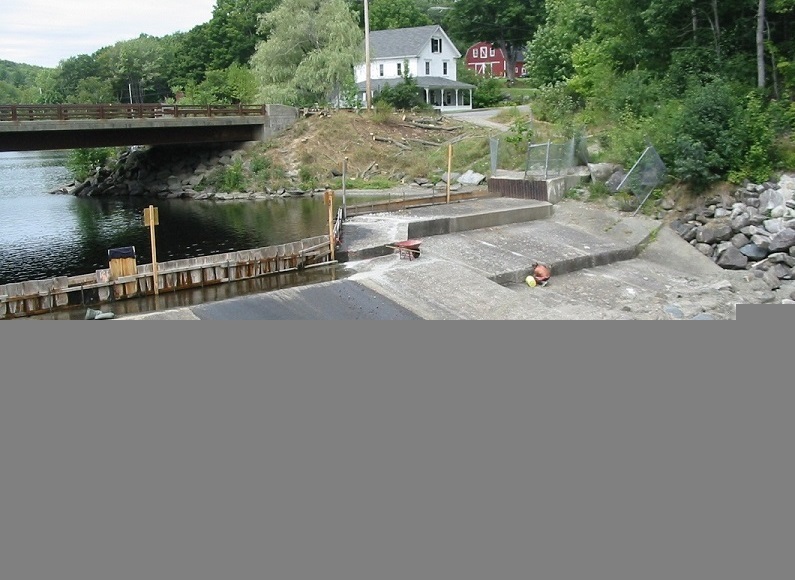 Radial gates and wheel mounted slide gates are most commonly used for large spillways. 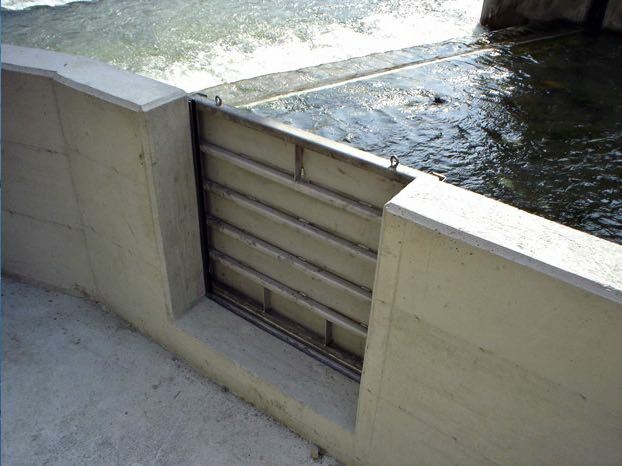 For simplicity of design and operation, the simpler control devices are considered appropriate for spillways for small dams. These devices include flash boards, stoplogs, rectangular gates, and radial gates, which should be used whenever possible because they can be easily fabricated and obtained commercially. Flashboards and stoplogs can be used as means of raising the reservoir storage level above a fixed spillway crest level when the spillway is not needed for releasing floods. However, safety of dams considerations often prevent the use of these devices. Flashboards usually consist of individual wooden boards, or structural panels anchored to the crest, stoplogs are wooden boards or structural panels spanning horizontally between slots or grooves recessed into the sides of the supporting piers. To provide adequate spillway capacity, the flash boards or stoplogs must be removed before the floods occur, or they must be designed or arranged so that they can be removed while being overtopped. These devices should be used only where adequate removal is ensured. Various arrangements of flash boards have been devised. Some must be placed and removed manually, some are designed to fail after being overtopped, and others are arranged to drop out of position either automatically or after being manually triggered when the reservoir exceeds a certain stage. They present a hazard if not removed in time to pass floods, especially where the reservoir area is small and the stream drainage basin is subject to flash floods. They require the attendance of an operator or crew and equipment for their removal, unless they are designed to fail automatically. If they are designed to fail when the water reaches a predetermined stage, their operation is uncertain, and when they fail they release sudden and undesirably large outflows. Ordinarily, they cannot be placed back into position while flow is passing over the crest. If the spillway functions frequently, the repeated replacement of flash boards may be costly. In some cases, they can be used only during low inflow periods. Stop-logs are usually wooden beams or structural steel panel units stacked one upon the other to the desired height. They form a bulkhead that is supported in slots or in grooves recessed into the supporting piers at each end of the span. The spacing of the supporting piers depends on the material from which the stop logs are constructed, the head of water acting against the stoplogs, and the handling facilities available for installing and removing them. Stop logs that are removed individually as the need for increased discharge occurs are the simplest form of a crest gate. Stop logs can be an economical substitute for more elaborate gates where relatively close spacing of piers is not objectionable and where removal is required only infrequently. However, stop-logs that must be removed or installed in flowing water may require elaborate handling mechanisms that make them as costly as gates with attached hoists. A stoplogged spillway requires the attendance of an operating crew for removing and installing the stoplogs. Furthermore, the arrangement may present a hazard to the safety of the dam if the reservoir is small and the stream is subject to flash floods, because the stoplogs must be removed in time to pass the flood.